There’s a great vibe in Costa Rica this season. So many happy tourists discovering what attracted the rest of us in the first place. Tourism numbers are strong and with that there is continuing interest in real estate here. With many incredibly solid deals on offer, it really is a great time to be looking for real estate. 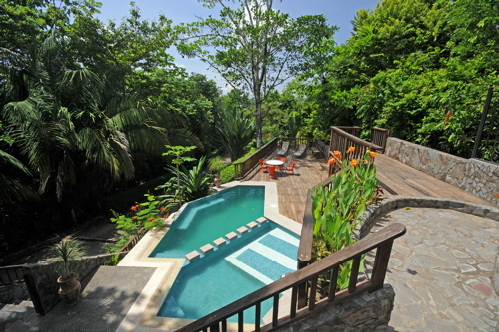 As always, we recommend you get down to Costa Rica and see for yourself what the country has to offer. We’d be more than happy to help point you in the right direction. Contact me if you want further information on any of the homes listed here or information any other homes, condo, businesses for sale in the area. 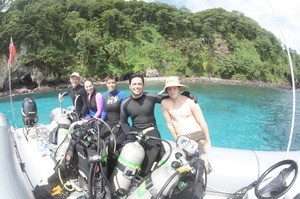 Diving at Cocos Island National Park is on many adventurer’s ‘bucket-lists’. The waters of this protected World Heritage Site offers one of the most concentrated large marine animal encounters in the world. 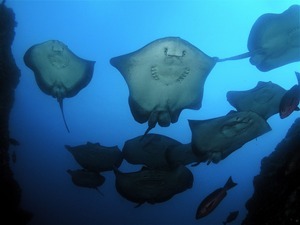 The convergance of multiple ocean currents brings in massive schools of hammerheads, tuna, jacks and more. 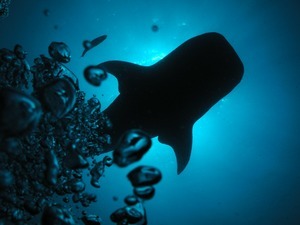 Passing dolphins, whale sharks and manta rays are sighted along with an occasional sailfish. Please feel free to email Onditz for more information on these incredible journeys. Boats leave from Puntarenas, Costa Rica. $100k price reduction. Killer views. Exclusive neighborhood. Great Villa in Faro Escondido with 3 bedrooms and 2.5 bathrooms with spectacular views. The villa has been updated and features marlbe floors and granite counters throughout. The master bedroom offers a splendid ocean view and its private bathroom with hot tub. The living room and kitchen are very open and feature great views of the ocean. 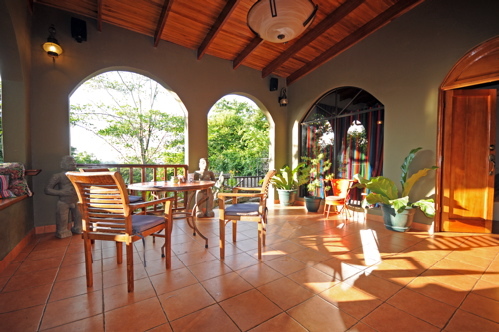 The condo also features a fantastic patio for sunset dining. Just reduced to $379K from $479k. Call for an appointment to view. Huge price reduction. Now $400,000. This house is move-in ready. And is priced to sell. Call today for more info. This beautiful vacation-style home on Calle Hermosa is surrounded by lush growth and is just a couple minutes to the beach. With four bedrooms, two bathrooms and ample entertaining space, this 350m2 home is perfect for the full time resident, or owner who wishes to utilize for rental revenue. Staggered decks allow for gorgeous vistas from every floor! 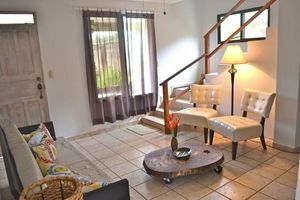 2 Bedroom Private Home with pool, short walk to beach, for just $150k! 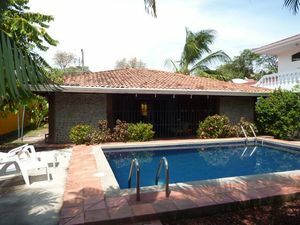 Lovely 2 bedroom/2 bath house with a large pool in a great neighbourhood in Jaco. Features lovely outdoor and indoor living areas and is perfect for someone looking for a nice home or potential rental property. Central location allows you to walk to the beach or town! Great open floor plan and is turn-key and ready to move in! Price Drastically Reduced and Priced to Sell! Great Value. Reduced from $395k to $295k. GREAT BEACH LOCATION!! Live at the beach in beautiful south Jaco and enjoy great sunsets, plenty of surf and all that Jaco has to offer. Quiet end of the beach. Sandy end of the beach. An amazing deal. 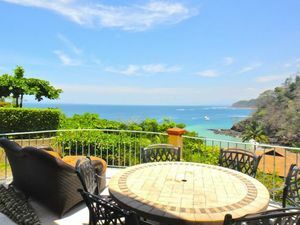 Perfect for a part-time home or a rental property (There is currently a list of repeat renters who book this house every year for their Jaco vacation.) Lots of potential. This furnished home has 3 bedrooms each with their own bathroom. The home has ocean views from the second floor and the quiet garden is perfect for relaxing in the dipping pool. Other amenities include: ceiling fans, A/C, laundry room, hot water, cable TV and storage. Just steps to the beach for surf and fun in the sun. Great price reduced from $395,000 to $295,000 Call Tina Wallace for more details (506) 8331-1811. For more information on Costa Rica real estate or any of these newsletter stories please feel free to contact Tina Wallace at TS Water.